My new book, Overshare, went on sale in Amazon's Kindle store early this morning, and because it's such an unusual book and I'm really pulling out all the stops...okay, as many stops as I can...to get some momentum going with it early on, I'll be periodically reporting on its progress here. I first introduced the book and offered a free excerpt from it here, so readers could see what's so unusual about it for themselves. In terms of promotion, I'm primarily focusing on two selling points for the book. The first is that it's a new kind of ebook, and in that sense, experimental digital literature. On the strength of this aspect, I've reached out to influential bloggers whose area of focus is ebooks, new forms of digital media, and experimental lit with advance review copies. There's been plenty of talk around the interwebs lately from people asking when we're going to start seeing new kinds of digital "books", and when authors are going to start exploiting all the possibilities digital media have to offer. Overshare forms a direct response to those questions, and I'm hoping it will inspire some of these bloggers to discuss whether or not it succeeds in this regard, and why or why not. The second selling point is the book's very timely and topical subject matter: online privacy as it relates to the use of social media. With recent security lapses on Facebook and the omnipresent news stories of online stalking and bullying, most people who use social media have some degree of concern about what they're putting online. Plenty of real and virtual ink has been spilled on email and social media account hacking as well, but Overshare focuses on a much more disturbing point: that in the course of ordinary use of social media, users typically expose far more about themselves and their lives than they realize or intend. Due to their very nature, which is to encourage maximum communication and the creation of huge, linked networks of people, social media have the insidious (if unintentional) tendency to lure us into a false sense of privacy and security. Even if you never post any of your private or financial details online, Overshare demonstrates that people can tell much more about you and your life than you probably realize when they take in the full picture of your online activity: Facebook, twitter and blogging. Add some wish lists from Amazon or eBay, some Likes, your Friends lists and shared links, and a total stranger can know as much about you as most of your real-life friends do. At the bottom of this post, I've provided a link to a pdf excerpt containing the first five chapters of my new "book", Overshare. For quite a while, many bloggers and digital media mavens have been asking when authors are going to start exploiting the possibilities ebook formats have to offer, and when they're going to start redefining the meaning of the word, "book". My new "book", Overshare, is my answer to those questions. I put "book" in quotes, because this novel takes a form unlike any other ebook you've ever read. I'm calling it a social media novel, because its content consists exclusively of simulated screen shots of the protagonist's public social media updates. This makes reading the book a voyeuristic experience, and has the added bonus of making the read lightning-fast since most of the content consists of images and one- to three-line status updates. Through this book, I hope to explore today's omnipresent concerns about online security and privacy, and inspire the reader to re-examine his own use of public social media. Perhaps, just as my protagonist Michael Ayres, some readers will find they're revealing far more about what's going on in their lives than they intend. 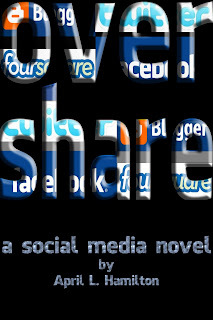 Here's that link to the first 5 chapters of Overshare in pdf format. The file is large, so please allow several seconds for it to load. Here's a link to buy the full book on Amazon. If you're an Amazon Prime member and you have a Kindle or Kindle Fire, you can now borrow any of my self-published Kindle books for free under the Amazon Prime Lending Library program! Just turn on your Kindle or Fire, go to the Kindle Store, and look up Adelaide Einstein (comic fiction, chick lit), Snow Ball (dark, comic mystery), Shorts (collection of shorts and flash fiction) or From Concept to Community (nonfiction, about strategies for maximizing traffic for a new online community on a shoestring budget, using Publetariat.com as an example). Here's a link to the Prime Lending Library page on Amazon, where you can get more information about the program and instructions for checking out and returning books. I'll be adding my new book, Overshare, to this program when it's published, too.